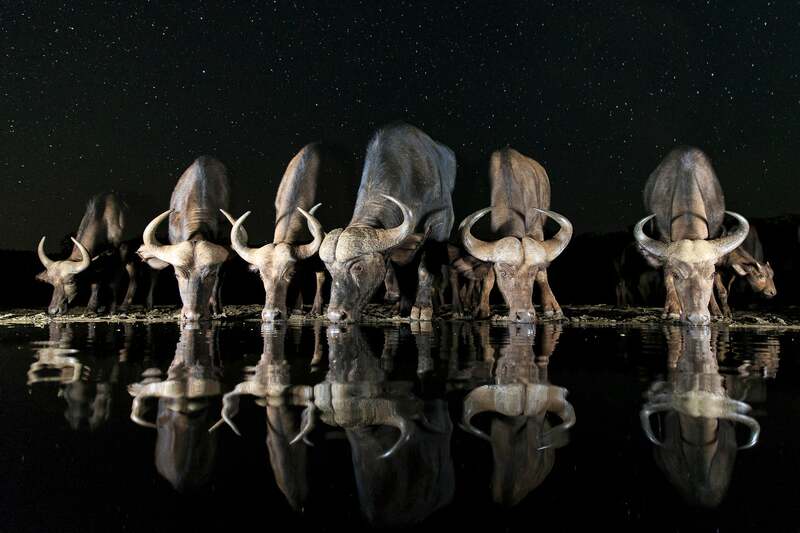 2017 marks the 10th anniversary of the Sony World Photography Awards competition. As we close in on the announcement of the winners, World Photography has put out the shortlist of contenders in the Open, Professional, Youth and Student Focus categories. Culling the entries down to this point has been no easy feat. More than 227,000 photos from around the world were submitted this year. Reflecting the truly international nature of SWPA, the shortlist has images from photographers in 49 countries. We’re showing just a few of the shortlisted images here. You can see all of the contenders at www.worldphoto.org. Image Description: Muharram mourning ceremony in Ardabil City/Iran. This is a picture in Iran from Muharrem ceremony (in Iran.) 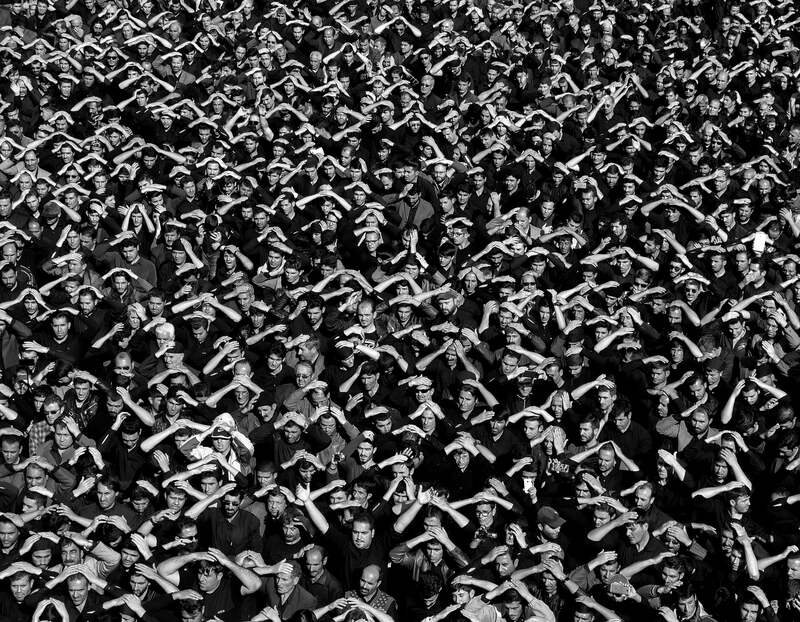 A photo taken at the events of the Iran people's mourning ceremony. Shot date 11 October 2016/16:40. Series Description: “Good day, doctor! Good evening, doctor”, voices of people of all ages greet her kindly as Floarea Ciupitu walks around the village. 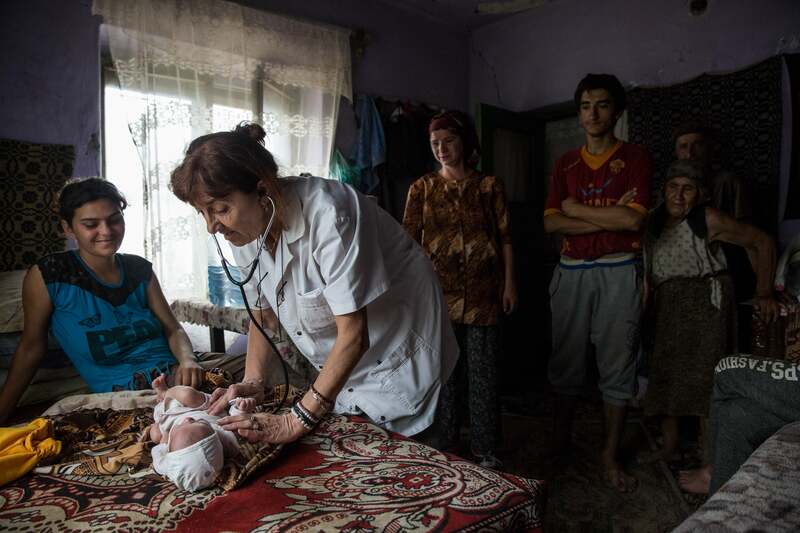 At 61 she has been a family doctor serving Gangiova, a village in south-west Romania for the past three decades. Ciupitu oversees roughly 1700 registered patients. On week days she sleeps above her practice in a tiny room, on an old hospital bed. At night, a tiny flashlight guides her way one store up to her modest accommodation, no electricity on the staircase. Romania has a population of almost 20 million. Doctors in rural areas are outnumbered by peers in cities two to one, while half of the population lives in the countryside. The healthcare sector is overrun with crises and never ending problems. In 27 years since the anticommunist revolution of 1989 the country has had at least 25 health ministers take office. Doctors, especially younger ones, are fleeing the country in search of better work conditions and career opportunities. The Romanian Health Ministry states there is a severe doctors shortage. While things may look a little better in the city, Romania's villages are plagued with a lack of access to healthcare. Family doctors are often overworked having to care for a larger number of patients than the recommended average. Ciupitu is living proof that, despite all the difficulties and the problems in a flawed system, there still are doctors who commit to their patients. She stands to help remember that being a doctor is a calling. 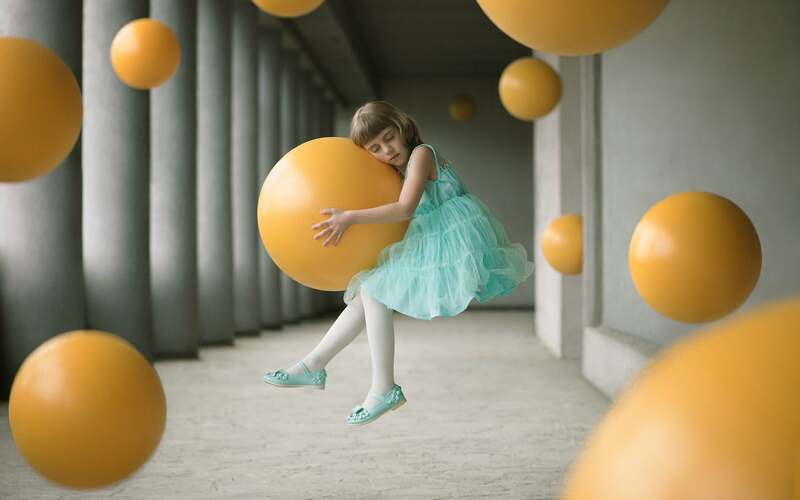 Image Description: Girl in weightlessness holding a ball, among many others. The child represents gentleness and fragility. Associated with the ball, expressing the lightness, it is the word innocence that is symbolized. For this image, time would be synonymous with gravity. In Grenoble South-East of France, April 9, 2016. Image Description: This picture was taken in February in Nagano-ken at an altitude of about 1,700 m. In Japan, February is the coldest season in a year. 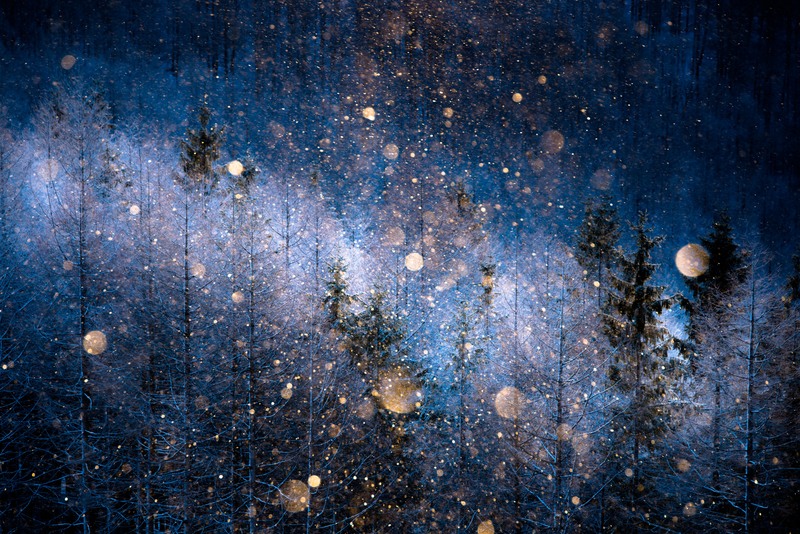 Diamond dust can be seen only a few times during cold season. So,it took 4 years to make this work since I started taking diamond dust. Orange circle is diamond dust. Diamond dust usually looks white, but it turns into orange just for the morning sunrise. I expressed the diamond dust as a silent forest fairy. Adjusting contrast and tilt to get closer to my image. 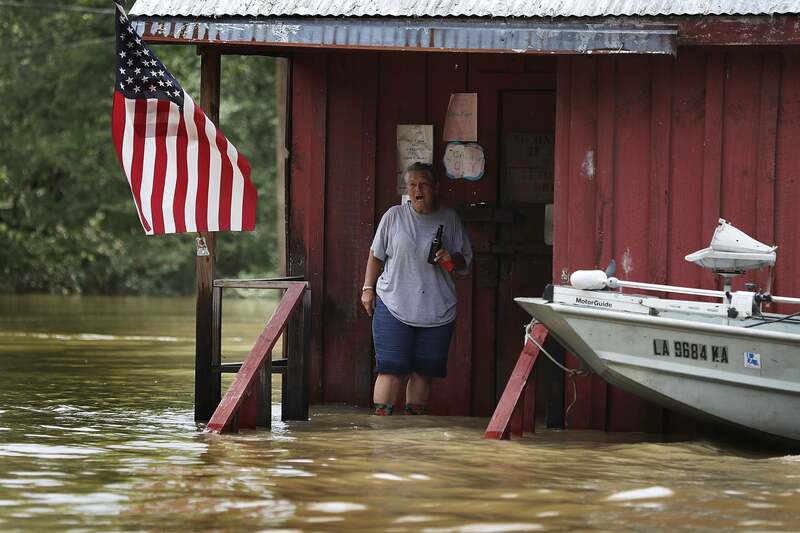 Image Description: A person is seen on the front porch of a home as it is surrounded by flood waters on in Port Vincent, Louisiana. Series Description: A historic flood, caused by a massive rainstorm, hit parts of Louisiana and overwhelmed local communities, causing thirteen deaths and damaging thousands of homes with flood waters. 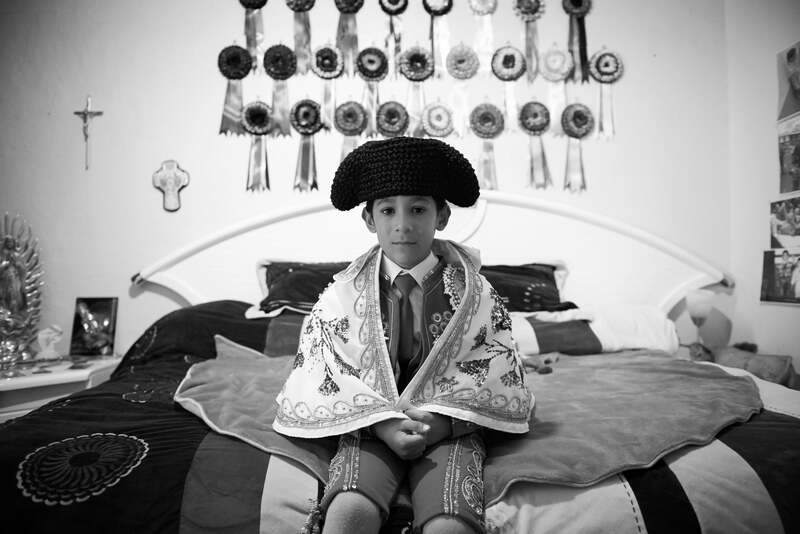 Image Description: Salvador, aged 6, sits on his bed in anticipation of witnessing the afternoon bullfight at Plaza de Toros Mexico. Behind him are several ribbons, each symbolize a bull dedicated to him by his matador heroes. Salvador's family is wealthy and staunch Catholics. They believe God will protect him from any harm. Tuition begins with a set of horns used to emulate the movement of a bull. Whilst learning how to evade contact, they must respond with the grace and style that is both customary and traditional. In time, they will work with small cows before ascending to fight smaller bulls. The bullfighting pre-season, called the Corrida de Novillos, is a proving ground for young fighters aspiring to attain the title of Matador de Toros; Both boys obsessively hope and pray to one day become professional matadors. The tremendously talented and promising Cristobal, aged 10, has been training for 2 years. He has since been invited by the famous bullfighter "El Juli" to train with some of the greatest bullfighters in Spain. Image Description: Mexico, Baja California, Sea of Cortez. 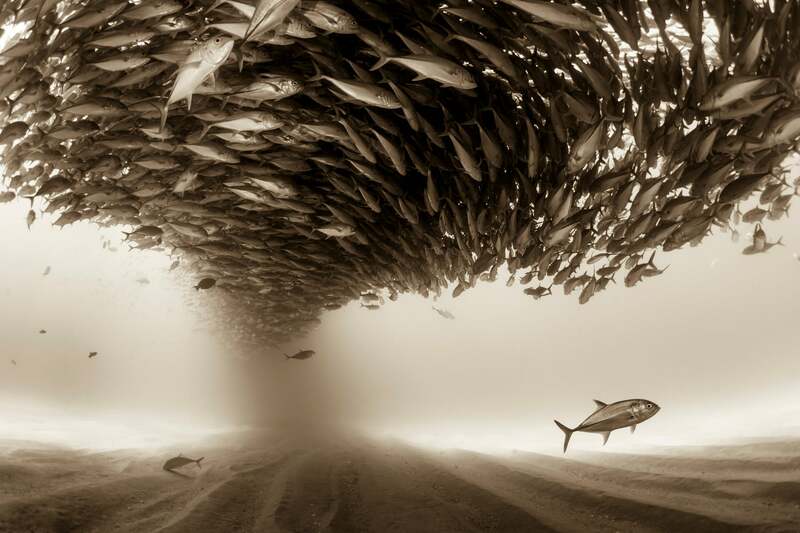 A big school of Jacks forming a ceiling found at the protected marine area of Cabo Pulmo. Series Description: Ever since I was a kid, as far back as I can remember, I was attracted to the sea. I dreamt about what lay beneath the waves, and how would it look if suddenly all the water vanished, leaving all the animals and living creatures in stasis. In this way, I could walk within the ocean and see them all, suspended for a moment in time and space. To this day I carry within me that dream; and very gratefully realise it through my photography. Each image is a visualisation of that sublime moment whereupon the beautiful marine life around me is frozen majestically in its natural environment. My intention is to capture the essence of being immersed in the experience and presence of the animal or habitat I am photographing, and to share with others their splendour and soul. I hope the images I capture contribute to the existing corpus of underwater photography in a way that energises each of us to form our own dream of preserving and creating a better world where we value and care for all expressions of life. Ultimately our understanding and celebration of the sheer beauty and poetry of life is intrinsically linked to how we communicate and bond with the myriad configurations of life energy surrounding us. In my case, it is the ocean and its marine inhabitants which inform my observance and joy for life. I in turn communicate this through my photography of the underwater realm.